Barack Obama’s second inaugural address: The president should declare war on the Republicans. Why if he wants to transform American politics, Obama must declare war on the Republican Party. 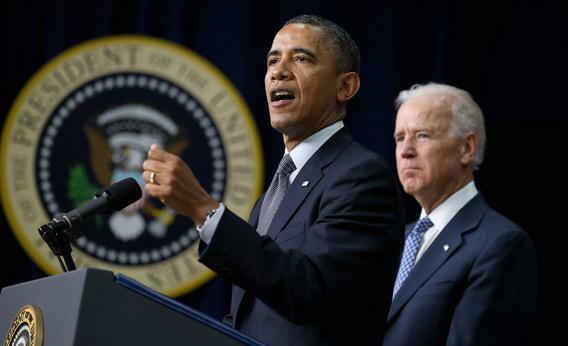 President Obama, left, and Vice President Biden announce the administration’s new gun law proposals on Wednesday in Washington, D.C.
On Monday, President Obama will preside over the grand reopening of his administration. It would be altogether fitting if he stepped to the microphone, looked down the mall, and let out a sigh: so many people expecting so much from a government that appears capable of so little. A second inaugural suggests new beginnings, but this one is being bookended by dead-end debates. Gridlock over the fiscal cliff preceded it and gridlock over the debt limit, sequester, and budget will follow. After the election, the same people are in power in all the branches of government and they don’t get along. There’s no indication that the president’s clashes with House Republicans will end soon. Inaugural speeches are supposed to be huge and stirring. Presidents haul our heroes onstage, from George Washington to Martin Luther King Jr. George W. Bush brought the Liberty Bell. They use history to make greatness and achievements seem like something you can just take down from the shelf. Americans are not stuck in the rut of the day. But this might be too much for Obama’s second inaugural address: After the last four years, how do you call the nation and its elected representatives to common action while standing on the steps of a building where collective action goes to die? That bipartisan bag of tricks has been tried and it didn’t work. People don’t believe it. Congress’ approval rating is 14 percent, the lowest in history. In a December Gallup poll, 77 percent of those asked said the way Washington works is doing “serious harm” to the country. The challenge for President Obama’s speech is the challenge of his second term: how to be great when the environment stinks. Enhancing the president’s legacy requires something more than simply the clever application of predictable stratagems. Washington’s partisan rancor, the size of the problems facing government, and the limited amount of time before Obama is a lame duck all point to a single conclusion: The president who came into office speaking in lofty terms about bipartisanship and cooperation can only cement his legacy if he destroys the GOP. If he wants to transform American politics, he must go for the throat. President Obama could, of course, resign himself to tending to the achievements of his first term. He’d make sure health care reform is implemented, nurse the economy back to health, and put the military on a new footing after two wars. But he’s more ambitious than that. He ran for president as a one-term senator with no executive experience. In his first term, he pushed for the biggest overhaul of health care possible because, as he told his aides, he wanted to make history. He may already have made it. There’s no question that he is already a president of consequence. But there’s no sign he’s content to ride out the second half of the game in the Barcalounger. He is approaching gun control, climate change, and immigration with wide and excited eyes. He’s not going for caretaker. How should the president proceed then, if he wants to be bold? The Barack Obama of the first administration might have approached the task by finding some Republicans to deal with and then start agreeing to some of their demands in hope that he would win some of their votes. It’s the traditional approach. Perhaps he could add a good deal more schmoozing with lawmakers, too. That’s the old way. He has abandoned that. He doesn’t think it will work and he doesn’t have the time. As Obama explained in his last press conference, he thinks the Republicans are dead set on opposing him. They cannot be unchained by schmoozing. Even if Obama were wrong about Republican intransigence, other constraints will limit the chance for cooperation. Republican lawmakers worried about primary challenges in 2014 are not going to be willing partners. He probably has at most 18 months before people start dropping the lame-duck label in close proximity to his name. This theory of political transformation rests on the weaponization (and slight bastardization) of the work by Yale political scientist Stephen Skowronek. Skowronek has written extensively about what distinguishes transformational presidents from caretaker presidents. In order for a president to be transformational, the old order has to fall as the orthodoxies that kept it in power exhaust themselves. Obama’s gambit in 2009 was to build a new post-partisan consensus. That didn’t work, but by exploiting the weaknesses of today’s Republican Party, Obama has an opportunity to hasten the demise of the old order by increasing the political cost of having the GOP coalition defined by Second Amendment absolutists, climate science deniers, supporters of “self-deportation” and the pure no-tax wing. The president has the ambition and has picked a second-term agenda that can lead to clarifying fights. The next necessary condition for this theory to work rests on the Republican response. Obama needs two things from the GOP: overreaction and charismatic dissenters. They’re not going to give this to him willingly, of course, but mounting pressures in the party and the personal ambitions of individual players may offer it to him anyway. Indeed, Republicans are serving him some of this recipe already on gun control, immigration, and the broader issue of fiscal policy. On gun control, the National Rifle Association has overreached. Its Web video mentioning the president’s children crossed a line. * The group’s dissembling about the point of the video and its message compounds the error. (The video was also wrong). The NRA is whipping up its members, closing ranks, and lashing out. This solidifies its base, but is not a strategy for wooing those who are not already engaged in the gun rights debate. It only appeals to those who already think the worst of the president. Republicans who want to oppose the president on policy grounds now have to make a decision: Do they want to be associated with a group that opposes, in such impolitic ways, measures like universal background checks that 70 to 80 percent of the public supports? Polling also suggests that women are more open to gun control measures than men. The NRA, by close association, risks further defining the Republican Party as the party of angry, white Southern men. The president is also getting help from Republicans who are calling out the most extreme members of the coalition. New Jersey Gov. Chris Christie called the NRA video “reprehensible.” Others who have national ambitions are going to have to follow suit. The president can rail about and call the GOP bad names, but that doesn’t mean people are going to listen. He needs members inside the Republican tent to ratify his positions—or at least to stop marching in lockstep with the most controversial members of the GOP club. When Republicans with national ambitions make public splits with their party, this helps the president. If the Republican Party finds itself destabilized right now, it is in part because the president has already implemented a version of this strategy. In the 2012 campaign, the president successfully transformed the most intense conservative positions into liabilities on immigration and the role of government. Mitt Romney won the GOP nomination on a platform of “self-deportation” for illegal immigrants—and the Obama team never let Hispanics forget it. The Obama campaign also branded Republicans with Romney’s ill-chosen words about 47 percent of Americans as the party of uncaring millionaires. Now Republican presidential hopefuls like Chris Christie, Marco Rubio, and Bobby Jindal are trying to fix the party’s image. There is a general scramble going on as the GOP looks for a formula to move from a party that relies on older white voters to one that can attract minorities and younger voters. Out of fear for the long-term prospects of the GOP, some Republicans may be willing to partner with the president. That would actually mean progress on important issues facing the country, which would enhance Obama’s legacy. If not, the president will stir up a fracas between those in the Republican Party who believe it must show evolution on issues like immigration, gun control, or climate change and those who accuse those people of betraying party principles. This approach is not a path of gentle engagement. It requires confrontation and bright lines and tactics that are more aggressive than the president demonstrated in the first term. He can’t turn into a snarling hack. The posture is probably one similar to his official second-term photograph: smiling, but with arms crossed. The president already appears to be headed down this path. He has admitted he’s not going to spend much time improving his schmoozing skills; he’s going to get outside of Washington to ratchet up public pressure on Republicans. He is transforming his successful political operation into a governing operation. It will have his legacy and agenda in mind—and it won’t be affiliated with the Democratic National Committee, so it will be able to accept essentially unlimited donations. The president tried to use his political arm this way after the 2008 election, but he was constrained by re-election and his early promises of bipartisanship. No more. Those days are done. Presidents don’t usually sow discord in their inaugural addresses, though the challenge of writing a speech in which the call for compromise doesn’t evaporate faster than the air out of the president’s mouth might inspire him to shake things up a bit. If it doesn’t, and he tries to conjure our better angels or summon past American heroes, then it will be among the most forgettable speeches, because the next day he’s going to return to pitched political battle. He has no time to waste.